ITREALMS: Nigeria, a Ponzi scheme? Nowadays, fraudulent activities on unassuming citizens seem to have continued unabated. 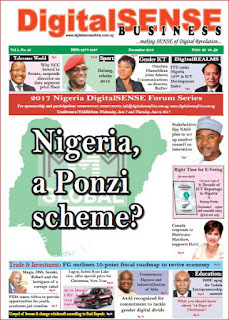 In this report, REMMY NWEKE asks, if Nigeria as a country is not a Ponzi scheme? By now you must have heard of Mavrodi Mondial Moneybox, popularly known as (MMM) across the world including Nigeria, with one’s relative, friend, neighbor or colleague, falling victim of the MMM scheme. 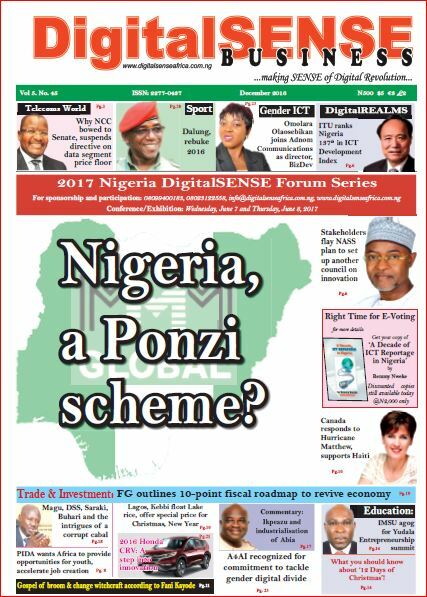 MMM, DigitalSENSE Business News gathered launched its official website in Nigeria on November 2015, with a claim of a "30 per cent per month" return on investment (ROI) in addition to accruable bonuses. Although the scheme have been largely described by the founders as a "mutual aid fund where ordinary people help each other." By end of January 2016, MMM had fully landed in Nigeria, the most populous black nation and 10 months later, and precisely by end of October 2016, an estimated 2.4 million Nigerians had signed up to this scheme; which primary aim was the teeming unemployed Nigerians, among other disenchanted populace who are saddened by the hardening economic realities of recession in the country. The unprecedented growth of the MMM scheme definitely attracted the attention of the members of the National Assembly both at the Senate and House of Representatives, prompting their resolution to quickly call on the security agencies, especially the Economic and Financial Crimes Commission (EFCC) to thoroughly investigate the so-called MMM. Nowadays MMM is defined as a Ponzi scheme game based on a fraudulent investment operation where the operator, an individual or organization, pays returns to its investors from new capital paid to the operators by new investors, rather than from profit earned through legitimate sources. Established 27 years ago, MMM was founded by the Russian trio of Sergei Mavrodi, his brother Vyacheslav Mavrodi, and Olga Melnikova, with the name of the company taken from the first letters of the three founders' surnames, according to the online encyclopedia, Wikipedia. Until 1991 December, MMM was importing computers and office accessories and by January 1992, tax police accused MMM of tax evasion, leading to the collapse of MMM-bank, culminating in the inability of the company to fund operations. By mid-1994 MMM had created an acclaimed “successful” Ponzi scheme, attracting investment from private sectors with promised annual returns of up to 1,000 percent. Industry watchers said it is not certain whether a Ponzi scheme was Mavrodi's initial intention, although such overgenerous returns might have been possible during the Russian hyper-inflation, not to talk of the attendant criminal cases against the lead founder of MMM scheme. МММ could pass for one of the world's largest Ponzi schemes of all time, in the 1990s estimated 5 to 40 million people losing up to $10 billion, just as in 2011, MMM re-opened as "MMM Global" with up to 110 subsidiaries per country, it became widely popular in various African countries like South Africa, Nigeria, Zimbabwe and Kenya. In Nigeria, the MMM operates with acclaimed deposit scheme that promises a 30 per cent interest on investment per month, involving the use of money from earlier investors to pay later investors, and the operators are aliens to Nigerian regulatory agencies, namely the Central Bank of Nigeria (CBN) and the Nigerian Deposit Insurance Corporation (NDIC) as well as the Corporate Affairs Commission (CAC), which makes it extremely difficult to legally identify the promoters, hence its widely criticized as a Ponzi scheme. Rising on the heels of a motion of urgent national importance raised by Hon. Akinlade Fijabi from Oyo State, who described MMM as a ‘Rob Peter to Pay Paul Scheme’ said the MMM operators are exploiting the economic situation of Nigerians that had left them desperate for income through any means without considering much of the consequences. For another lawmaker from Ondo State, Bode Ayorinde, lawmakers’ intervention is crucial because they will likely be inundated with petitions if the scheme goes burst. Just as his Enugu counterpart, Dennis Amadi, said the House should save Nigerians from themselves, because the collapse of MMM could make many commit suicide. Precipitating, the Speaker, Yakubu Dogara ruled that the motion was adopted and urged the committee to expedite its investigation and report back to House within four weeks. But before the duration of the investigation could go mid-way, CBN warned Nigerians insisting that MMM is a Ponzi scheme and invariably on suspicious of what could befall MMM, the promoters sent out words on November 13 that all members account in Nigeria have been frozen for one month, due to an alleged system overload and negative media reports, while it has since been proven that the authorities may have actually frozen the MMM account in Nigeria. Whereas Lagos State Emergency Management Agency (LASEMA) warned Lagosians to dial their emergency numbers if they spot anyone trying to commit suicide over the frozen of MMM account. LASEMA said it took a queue from what happened in Russia, occasioned by MMM. According to him, he had invested all his savings from the National Youth Service Corp (NYSC) in Savanah Bank; because the Bank packed up and left him with nothing, stressing that he once bought 10,000 shares in Transcorp when the former President Olusegun Obasanjo and "Madam Stock Exchange" initially sold what he alleged as the fraud to Nigerians, but up till today, “no shares were allocated to me and my money was not refunded. He also recollected that his former employer deducted money from his wages and paid into government-owned Housing Fund and also into the National Pension Fund; the 2 bodies were dissolved and his money dissolved with it. Lamenting that his father and millions of Nigerians equally paid into the same funds for over 30 years and nothing came out of it. Where are the community banks? Vote for change, churches and mosques? He went on to note that most Nigerians work hard for and contributed when their Churches or Mosques wanted to establish those private universities and now their children are excluded from the qualitative education they offer because their parents or guardians, cannot afford the tuition fees? What do you think about the money you pay to NEPA, PHCN or whatever it is called now every month regardless of whether they supply you electricity or not? Whilst the frozen continues, the MMM Founder, Sergey Mavrodi detailed a letter to the Federal Government (FG) led by President Buhari for the recent frozen of all bank associated to the scheme, wondering why life is hard for Nigerians if the government of the day has a solution to the citizens’ plights. According to the News Agency of Nigeria (NAN), Sergey Mavrodi, noted that “Honourable Authorities, So far MMM has come under a constant attack from you. In this regard, I would like to ask you a few simple questions. Since you are concerned with the interests of millions of your fellow citizens, I hope that you would be so kind to answer them. “What are you trying to get? Do you want the MMM System to collapse and millions of people to suffer? Who will support them then if now MMM is their only means of livelihood? Will you? You even don’t pay wages to people? Or might you not care about them? Might you be using a trendy topic to make a good name for yourselves? What will you say to a mother who will have no money to buy food for her child? Will you let her child die for the sake of the higher interests of the economy? “You say that MMM is a scam. What is the scam here, if all members are warned in advance about all the risks, the possible and impossible ones? They know there are no investments at all. The warning is a red text on a yellow background placed on most prominent place of the website. “You say that MMM is bad. Why? Yes, it produces nothing, but nothing gets out of the country either. The money is just redistributed among the citizens of Nigeria. It gets from those who are richer to poorer ones, in this way restoring social justice. What”s wrong with that? “And finally. If you know what is right for people, why is the life so bad in the country? With the content of his letter, Mr. Mavrodi has undoubtably accepted that actually MMM is a scam of which people or so-called investors warned with texts on a ‘red’ colour signifying danger after all. For most Nigerians, MMM is another WonderBank likewise there are others in the market place like Ultimate Circle to name a few. Even though some Nigerian victims are already consoling themselves that if Ultimate Circle could bounce back, nothing stops MMM from doing same. They claimed that those writing against MMM are non-participants. And like acclaimed Nigerian-Ukraine-based Transformation Strategist, Pastor Sunday Adelaja, Nigerians must be cautious of over 15m causalities of MMM globally, insisting that the terms Ponzi schemes and pyramids were new in the former Soviet Union until MMM entered. Ponzi schemes and pyramids are a long known fraudulent way from getting money from rather ignorant people. Whereby operators pay returns to the participants, from fresh money coming in from newly recruited members. A legitimate business on the other hand, he said, must be involved in production of goods or services through which profit is made. A profit therefore is made legitimate by the exchange of goods or services produced. When it comes to Ponzi schemes and pyramids however, they do not produce goods or service so there is no process of production whatsoever, therefore there is no legitimate means of making a profit. Ponzi schemes and pyramids like MMM base their operations on the greed of men to make quick money without paying the price of hard work. You may well decide what you really want because from investigations, every other thing on the site seems to be working fine except withdrawing of funds. The truth is that over 3 million Nigerians are engulfed in this scheme and deserves government attention, unfortunately like Mr. Oliver stated, even the government itself has been involved in duping the citizens. So decide you today, who to believe. Most of you all are secretly paying the admins of different ponzi sites, and i know quiet all right that many of us have loss money on different platforms..
contact Mr. Musa Abdullazeez on 09067874359 if you want to have your own ponzi scheme today at a very cheap rate ranging from 50,000 to 200,000..
*PAYMENT VIA BANK TRANSFER ONLY*.